"Physicists from around the world are trying to understand what these mysterious neutrinos are telling us," said Fermilab director Michael Witherell. "Today, we are embarking on a journey of exploration using the most powerful neutrino facility in the world." Michael Turner, the National Science Foundation's Assistant Director for Mathematics and the Physical Sciences, believes the neutrinos' infinitesimal mass belies their significant and ubiquitous impact. "Neutrinos are always referred to as ghostly particles, as if they are of little interest and have to be apologized for. Nothing could be further from the truth. Neutrinos account for as much of the mass of the universe as do stars, they play a crucial role in the production of the chemical elements in the explosions of stars, and they may well explain the origin of the neutrons, protons and electrons that are the building blocks of all the atoms in the universe. MINOS will help us better understand how neutrinos shaped the universe we live in." The MINOS experiment will use a neutrino beam produced at Fermilab's Main Injector accelerator to probe the secrets of these elusive subatomic particles: where do they come from, what are their masses and how do they change from one kind to another? In Minnesota, a 6,000-ton particle detector will search for neutrinos that may have changed from one kind to another during the 2.5-millisecond trip. Trillions of lab-created neutrinos will pass through the MINOS detector each year. But because neutrinos interact so rarely, only about 1,500 of them each year will collide with atoms inside the detector. The rest pass right through with no effect. 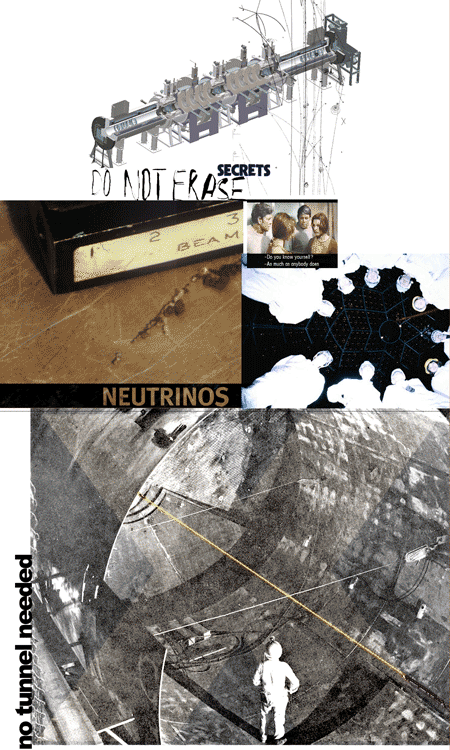 MINOS scientists will use the change from one type of neutrino to another as the key to discovering neutrinos' secrets. Generating the neutrinos destined for Minnesota required building a beamline housed underground at Fermilab (near Chicago, Illinois). The beamline is a 4,000-foot tunnel, whose direction, roughly north and slightly down, points from Fermilab to Soudan. The beamline tunnel holds the components which generate the neutrinos from protons accelerated by Fermilab's Main Injector. Then comes the MINOS Hall, a 120-foot-long cavern located 350 feet below the surface of the lab campus, with access by an elevator traveling the equivalent of a 30-story building. The MINOS Hall holds the near detector, a smaller version of the MINOS detector at Soudan, which is used to measure the properties of the neutrinos at the start of their trip to northern Minnesota. Neutrinos, ghost-like particles that rarely interact with matter, travel 450 miles (730 km) straight through the earth from Fermilab to Soudan -- no tunnel needed. The Main Injector Neutrino Oscillation Search (MINOS) experiment will study the neutrino beam using two detectors. The MINOS near detector, located at Fermilab, records the composition of the neutrino beam as it leaves the Fermilab site. The MINOS far detector, located in Minnesota, half a mile underground, will again analyze the neutrino beam. It will allow scientists to directly study the oscillation of muon neutrinos into electron neutrinos or tau neutrinos under laboratory conditions. what are these 'visitors' made of?